Looks like whoever painted the sign was on their way out and not their way in. 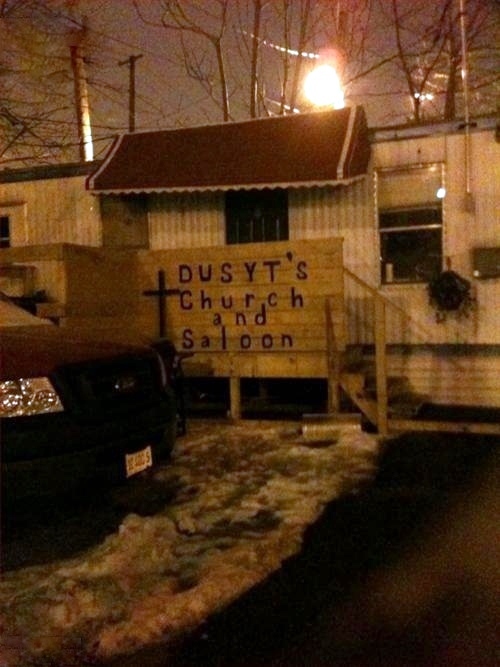 Dusyt’s, where you can pray at the porcelain altar or call God on the big white phone. Twelve days and counting, babes. This entry was posted in Alcohol, Humor and tagged Alcohol, functional alcoholic, Functional Alcoholic Spokesperson, functional alcoholism, Humor, Slurperson. Bookmark the permalink. Thanks for the support, Erin! Boone’s Farm and Beef Jerky, brother! I may very well baptise my daughter here. You could christen her with champagne…like a boat. I’m proud of you. Life has been feeling pretty good with you on the wagon.